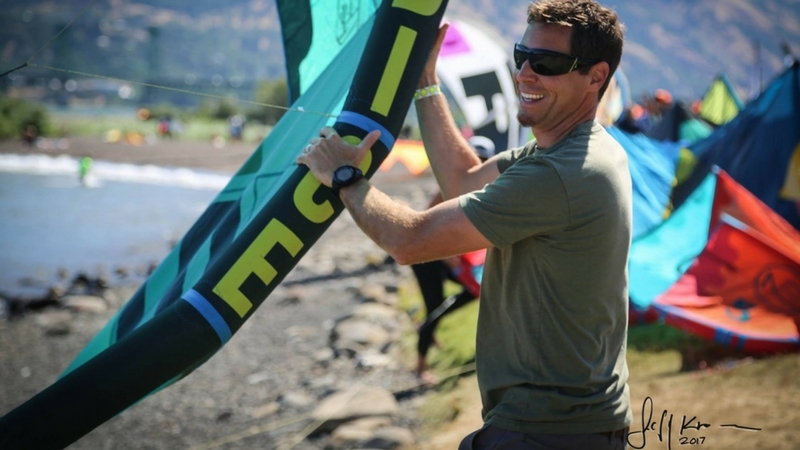 I soon realized the kiteboarding community was full of like-minded people who also loved skiing, sailing, and who genuinely had a love for life. I used to live for skiing. During the summers I would fill my calendar with "other" activities as I waited for ski season to return. Come June I almost didn't know what to do so I lost myself in windsurfing, wakeboarding, kayaking, backpacking, or mountain biking as ways to fill my time. Sometimes I resorted to golf and tennis, which I still like, but come second to adventure sports. None of pursuits floated my boat like skiing; but I participated in those activities as often as possible while taking my mind off skiing. Windsurfing and wakeboarding were fun, both took enormous amounts of gear and gas. I practically needed a VW van to transport my windsurfing gear and needed a very powerful boat to wakeboard. Luckily I had great friends back then (as I do now) and we shared the load. Rewind the calendar 10 years. Summer of 2007, 10 years ago, one of my best friends wouldn't go fly-fishing with me. I couldn't get him off the sofa, it didn't make sense. I investigated and it turned out he was learning how to kiteboard. I thought to myself, that sounds lame, but then I went, and was immediately hooked. 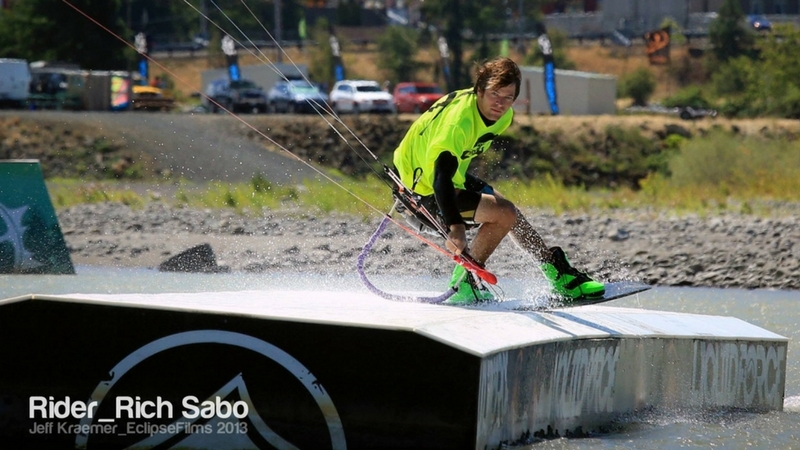 I soon realized that kiteboarding was way more fun than wakeboarding. Not only was it more fun--but it was a clean sport without fuel exhaust; and I didn't have to be trapped on a boat for hours on end. It was clear from that point on that kiteboarding was as much fun as skiing and I could do it exactly when skiing ended in the spring; until skiing picked up in the fall. I would honestly say it's the most fun you could have standing on two feet next to skiing. Once I started getting into kiteboarding I soon realized it was a community of like-minded people who also loved skiing, sailing, and genuinely had a love for life. Today-- all my best friends are kiters by summer and skiers in the winter. I loved my non-adventure friends before kiting; however they have taken a hiatus from me because I need to be with my tribe--and that tribe is now my life. Last month a group of us got together for a downwinder in the gorge. It was a very windy day and we all piled into a friend's RV in Hood River and went to an upwind launch site. (A downwinder is when you leave from one point and sail to another point downwind. 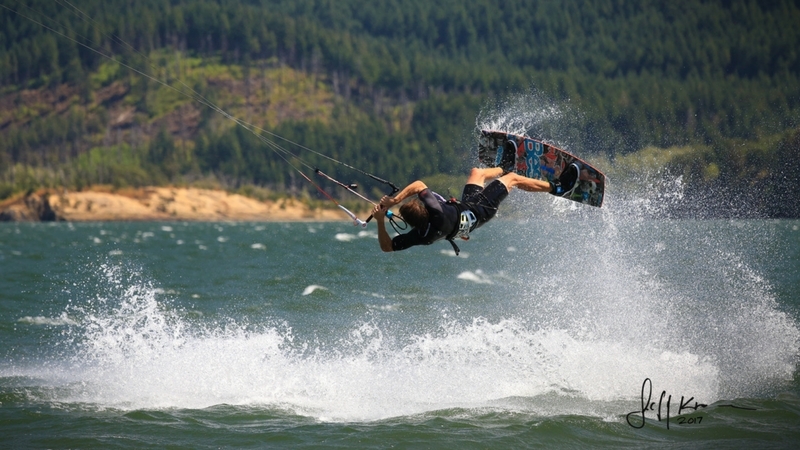 Typically in kiteboarding you can either do a "downwinder" -or- sail "point-to-point" from the same location). When we got there another van showed up with a another 6 or so people, and soon after that more vans rolled in and there must've been a dozen rigs with about 45 people. You have to understand that this particular launch site will only will support six people at the most. Today there were 45+ of us. And because we all knew each other-- from the mountains-to-the-coast --and hadn't seen each other for almost a year---everybody was so excited just to BE THERE! Stoke was level 10 before we got on the water! It was one of those days that most people never get to experience in their entire life. The great thing about this particular day was that every person helped each other out in a dangerous windy environment and got on the water without any problems or bad mojo. It was a miracle that no one had any issues on launch or during the downwinder. --Sure we all went kiting and had an awesome afternoon. The point isn't so much about the actual sport itself-- it's about the deep reaching bond it has within our souls and our community-- which is similar to skiing. One difference is you can recognize everybody on the beach easily; where in skiing you might be on the same chair with someone and not realize that they're your neighbor until the third run! 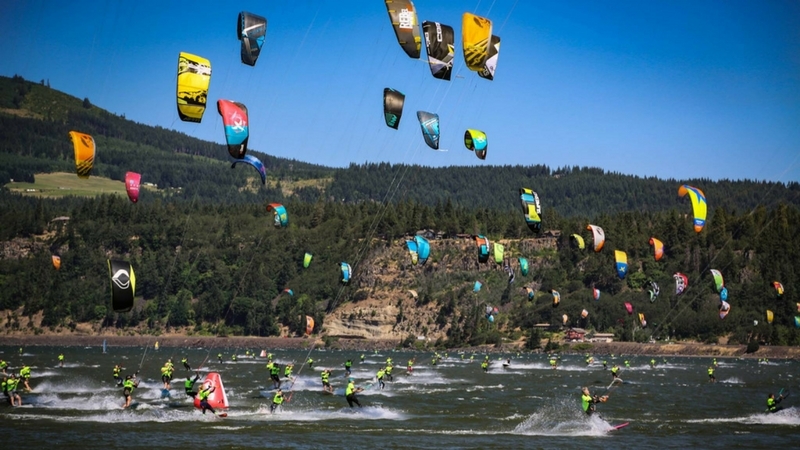 Kiting is an adventure sport much like surfing except without the localism. It's quite the opposite from surfing. People are genuinely eager to share the "secret spot". There are typically no haters---there is only stoke. No matter which beach you visit worldwide, you will find the same type of people with a genuine regard for love, life, and happiness. 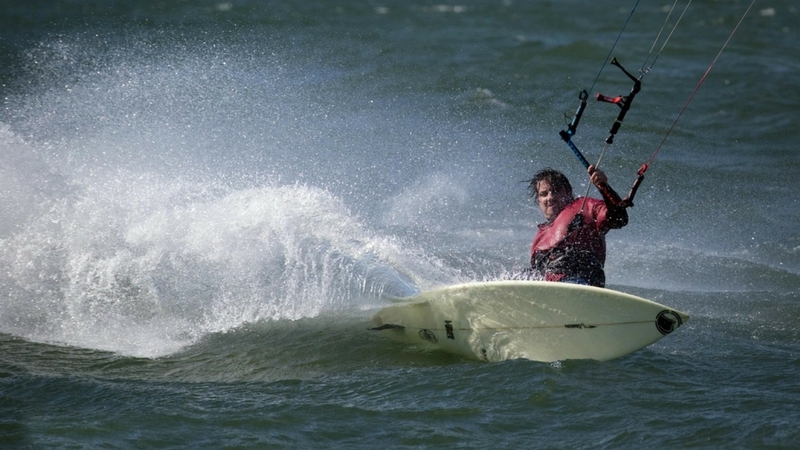 If you think kiteboarding is for you-- call me; and I'll get you introduced to the next phase of your life. 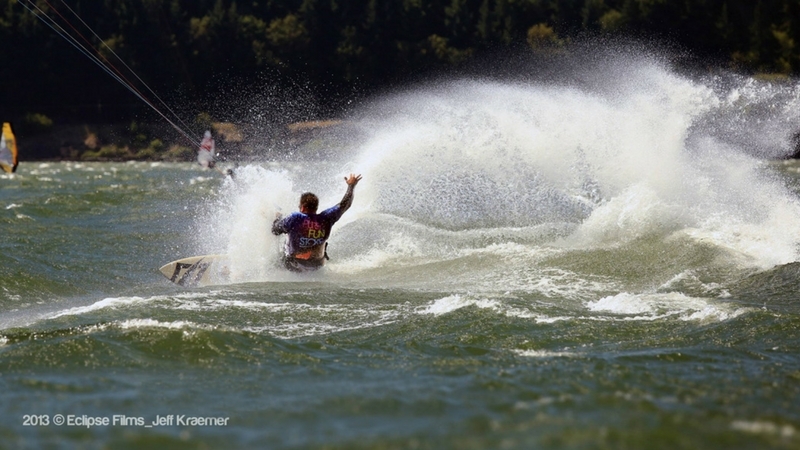 I must warn you; kiteboarding is addictive. However; it brings so much more good into your life that it's worth it!